This month, I have read two nonfiction books about writing, both by children's author Mabel Robinson (1874-1962). In addition to being the author of Newbery honor books Bright Island (1937) and Runner of the Mountaintops (1939), Robinson also taught an advanced fiction writing workshop at Columbia University from 1919 to 1945, which is said to have resulted in the publication of over 200 books. The two writing guides, Juvenile Story Writing (1922) and Writing for Young People (1950), were published at either end of her teaching career, and reading them together has given me some interesting insight into the changes in children's literature after World War II, and the way these changes did or did not influence Robinson's opinions on writing. Juvenile Story Writing begins with an explanation of the purpose of writing for children and explores the sources authors might use for inspiration. It devotes a chapter to each of four types of children's stories - Adventure Stories, Fairy Tales, Animal Stories, and School or College Stories - and provides a list of examples of each. The remainder of the book then focuses on different aspects of the craft of writing (characterization, dialogue, plot, theme, chapter arrangement, etc.) and it concludes with a chapter on writing about child characters in books for adults. Throughout the text, there are long excerpts from books which must have been popular at the time. Some are familiar even today (The Story of Dr. Dolittle, Little Women), but most have fallen into obscurity. 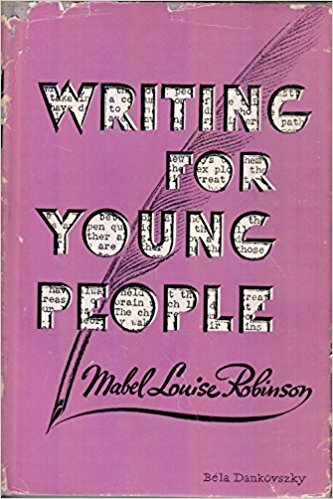 In the Foreword for Writing for Young People, Robinson explains that she had originally intended to simply republish Juvenile Story Writing, which had gone out of print. When she read it, however, she determined that it was outdated and needed revision. 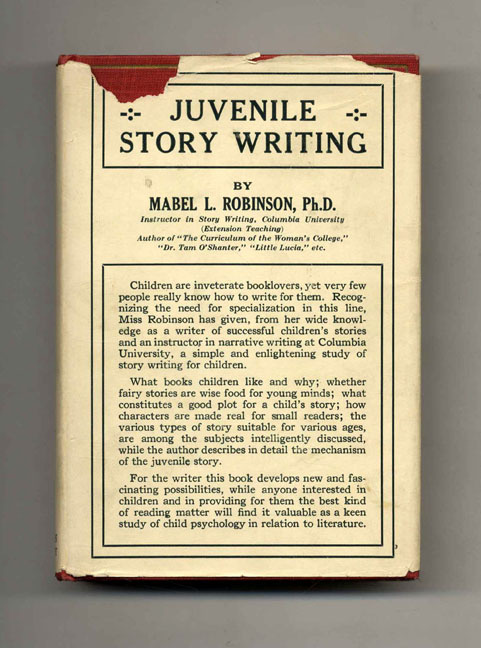 In this revised edition, Robinson removed all of the book lists and many of the excerpts she had used in 1922 to illustrate different aspects of successful writing for children. She did keep pretty much every reference to Dr. Dolittle, almost to the point of annoyance, but in other instances she either removed the examples altogether or included passages from her own books to illustrate her arguments. Though she never identifies them by title, Robinson also relies heavily on student work from her course at Columbia to explain how authors find inspiration, determine which point of view to use, and develop their personal styles. The commentary on aspects of the craft of writing remains virtually unchanged, but new genres are added (mysteries, biographies, "home" stories) and there are additional chapters at the end of the book addressing style as well as the day-to-day work of a writer. What was most interesting about reading these two books side-by-side was how much difference 28 years makes to the credibility of Robinson as an expert on children's writing. Though her opinions on how children's authors ought to write do not seem to change significantly between 1922 and 1950, my confidence in her authority was much stronger when I read the second book. With two Newbery honor books under her belt, and examples from her own work to back up her arguments, she is no longer just a teacher of writing putting together a potential text for her own class, but an accomplished writer with real, concrete advice to give and a confidence behind her delivery that, in light of reading the second book, seems to be missing from the first. I also noticed how much more she had to say about the different genres and types of stories in the 1950 book. Her 1922 advice about writing animal stories, for example, felt very bland and ordinary, but in 1950, it is almost forceful, as she suggests that all people ought to love animals, and waxes poetic about her own dog and the stories she writes about him, including 1949's Back-Seat Driver. Her comments on mysteries, comics, school stories, and fantasy (which replaces fairy tales) are similarly personal, nuanced, and authoritative. The 1922 book is certainly valuable as a textbook for writers, but all those years of experience teaching her writing workshop clearly make the 1950 book the superior volume. In terms of the literature itself, I was surprised by the limited number of genres available for children in the 1920s compared with the 1940s. The genres Robinson covers in the 1950 book are much closer to those still being published today, while some named in the 1922 edition (college stories, for example) barely exist at all anymore. I also wondered about some of the references Robinson removed when she revised the book in 1950. Walter de la Mare's poems and The Secret Garden are both still widely read today, but both only appear in the 1922 book. By the same token, a Kipling short story called "Little Tobrah," which was completely unfamiliar to me, was kept in the 1950 book, along with a novel by J.M. Barrie entitled Margaret Ogilvy. I couldn't tell whether Robinson just thought these books were too excellent to exclude regardless of their obscurity, or if she believed these would be stories that would stand the test of time. Either way, it did make me think about how difficult it is to know, at your own point in history, which books from your time period will become the classics of the future. I own both of these books and intend to keep both, as my husband and I are both big fans of Mabel Robinson's novels, and we are curious enough about the history of children's books to dig more deeply into some of those 1920s book lists. I don't think much has changed about the qualities of great writing since 1950 (or, really, since 1922) so I also think her advice is valuable for contemporary writers, and that even those so-called outdated references in the 1922 edition are worth analyzing for those who aspire to write. That said, Juvenile Story Writing is available free online, so if I were going to purchase just one of these, I'd stick to Writing for Young People. It's a great resource for understanding how to evaluate a children's book, as well as a handbook for good writing, not just for kids, but in general. Obviously, authors looking to publish today will probably need to consult some newer books to find out about the 21st century publication process, but otherwise I think Robinson is as worthy a writing instructor as one is likely to find.